When you’re going through fertility treatments, your thoughts are on your next treatment, your next option. At some point—whenever you let yourself—you may even venture to think about the moment when you’ll hold your baby in your arms. But what about after that? 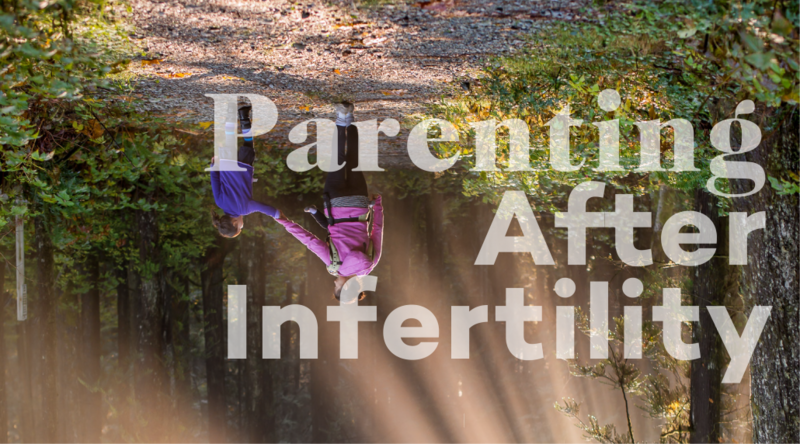 Does your experience with infertility affect your parenting? I think it does. Before I explain what I mean, let me make something clear. Parenting is hard, really hard. The number of choices you have to make every single day that influence the well-being and development of your child is mind-boggling. This article is merely based on what I’ve seen and thought and is no way a commentary on other people’s parenting styles. Parenting really starts when your baby is in the womb. After all, that’s when you first nurture and care for your little one. I thought pregnancy would be wonderful. I pictured myself as this glowing pregnant woman eating ice cream and thoroughly enjoying growing a life. Instead, at times, it was a tunnel of fear, speared on by my paranoia about the baby not being okay or not surviving the pregnancy. The ultrasound at CNY every week was a blessing for those first 12 weeks. Each one verified that our little one was alive, that his heart was still beating. The weeks between our discharge from CNY and our first OB appointment were a struggle. I was so scared that we would lose our baby at that time. Pregnancy did get easier once our little guy was big enough for me to feel his movements, but even then I found myself worrying that the tiny kicks weren’t frequent enough. While I did appreciate and cherish both my pregnancies, my emotions were so different from what I expected. Now that I’m fully entrenched in parenting, I have the sense that I cannot get enough time with my kids. We rarely have done something without our children since Chase was born almost three years ago. Where we go, our kids go. If I’m home on a break or for the weekend, I’m with my children. I have friends who have their kids continue to go to daycare during school breaks. Doing that is something that would never cross my mind, and I think that stems from those desperate years of wanting a child. Even when my boys are driving me nuts, the solution is never to give to them to someone else for a few hours. That said, I’ve realized recently that adult time is something Chuck and I are lacking. As soon as we can arrange for babysitters, we are totally going on a date. For me, taking time away from my children spawns parent guilt. I don’t know if this phenomenon affects all parents, but my Facebook newsfeed makes me think it does not. By parent guilt, I mean I feel terrible if I leave my children with anyone. Honestly, I even felt guilty the time I left them all with Chuck and went to Harry Potter trivia—and he’s a wonderful father and stay-at-home dad. Even though I know I need to step away from my boys sometimes, I feel like I should be spending every moment with them so I really struggle to leave them in someone else’s care. On top of that, even the people I trust the most still have me worried when they have my kids. What if Sam is extra fussy? What if Chase won’t eat his dinner or Henry falls? Potentially consuming questions are almost endless. It takes a lot to shut them out, turn my phone on vibrate, and just enjoy myself. As I’m writing this, I’m wondering how much of our decision to have Chuck stay at home with the boys was influenced by our infertility. I always knew that I would not give up my career. When we were faced with the choice between daycare and having Chuck stay at home, the decision was simple. We wanted one of us to be spending the workday with our children. If we had easily conceived, I’m not sure we would have made the same choice. We would have thought about it, but I don’t know that we would have let the reality of living on one income be less important than one of us being with our children. Like I said before, parenting is tough. When Chase was one, we made a decision I never saw coming: we bought a toddler backpack with a leash. I had always insulted parents who use leashes, saying that they need to be able to control their child. I never understood why they just couldn’t make their child hold their hand. And then we were planning a trip with Chase to GenCon, a gaming convention of 50,000 plus people. Our adorable toddler loved to run and could so easily get lost in those crowds. Whenever he was out of his stroller and walking, we strapped him into the leash backpack even if he was holding our hands. Why? Because we did not want to risk losing our precious boy. Even though I initially had reservations about that backpack, I realized during that convention that I am absolutely willing to endure that stares and comments if my child is safe. Being willing to be judged and shoving that aside has become a huge part of our parenting. I have always been a people-pleaser, but with my children, I have found that my comfort level and their safety supersede others’ opinions. When Chuck and I make a decision regarding our children, whether it be when they can have blankets in bed or when it’s appropriate for them to eat certain foods, we stick to it. This is a bit surprising to me since I’ve always highly valued my parent’s opinions, but I have found myself going against them occasionally, which is something I never thought I would do. An example of that was our tendency to not want to put Chase down when he was an infant. Even though I was told over and over that he needed to learn to sleep in a bassinet during the day, I would hold him for hours while he slept. I didn’t know if I would have another child, and I didn’t want to miss one second of holding my miracle. Even when Chase was past the infant stage, I would come home to find Chuck snuggling him on the couch. Along those lines, my mom has told me that I come off as a parent who doesn’t want others to hold her children. I’ve tried to explain that that’s not the case; I love my family and trust them to snuggle my kids. It’s more than I’d rather hold them because they’re mine, and they’re only little for so long. Even when I “give them up” at family functions, I’m constantly walking by to check on them. Sorry, family, for being a hover parent. Now I’m wondering if you’re reading this and thinking that I’m a crazy overprotective parent. You may be wondering if Chuck and I plan to keep our kids wrapped in bubble wrap so nothing can hurt them and plan to take care of the bullies and mean people for them. Short answer: nope. My children will learn to fight their own battles and advocate for themselves. They will get scraped knees and busted chins, and I hope they will learn to stand back up and walk it off. But they will also always have us behind them, knowing they have our support and love. In this case, that’s just good parenting, nothing really to do with our infertility. What our fertility journey did teach us is the value of giving our children the tools to weather storms. We can be protective, especially when they’re young, but we also need to ensure that they have the ability to cope and move forward when life throws a curveball. For those of us with infertility, that is a vital part of getting through it. So is parenting differently after infertility? In some cases, no. Parents, in general, do (or should do) the best they can for their kids. That’s universal. But what infertility does do is make you a bit more cautious, a bit more scared of the world. And you always, no matter how many little blessings you have, are aware of the effort, heartache, and joy that went into forming your perfect babies. And that, I think, is the real difference. Because that awareness never leaves and always has a little bit to say with each decision that you make.